Great architects like David George, FAIA contribute to our community and civilization in subtle and conspicuous ways. Even the prolific architects design fewer residences in a lifetime than painters create pieces for a single exhibition. One might be fortunate enough to know of a specific home or homes an architect has designed and is able to knowingly admire that home with proper attribution. These architecturally significant homes inspire, educate and encourage more good houses. What is much more subtle is the influence architects have on other architects and designers. A community’s architecture is not made up of disparate architects or architectural styles that do not influence or impact each other or future work. The architecture of Dallas is the result of the interaction and influence of exceptionally talented architect like David George. David Webster George was apprenticed to Frank Lloyd Wright at Taliesin where he became a Taliesin Fellow and worked closely with Wright on projects in Dallas. David George was also elected Fellow of the American Institute of Architects. He recieved twelve architectural design awards and recognition from the Architectural League of New york and the American Federation of Arts. David George studied at the University of Oaklahoma and recieved his architecture degree from North Carolina State University. He served his country in WWII and Korea. The reason the architecture in Dallas is so strong is the depth of regional, national and international architects who have worked in Dallas and continue to work in Dallas. The influence of architects on other architects is sometimes quite apparent and sometimes just a suggestion. This body of work gives Dallas both its architectural pedigree and, more important, its look, its feel, and an architectural identity that makes Dallas Dallas. On the left, architect David George and architect Jim Wheeler in home he designed in 2011 before panel conversation. Two and a half years ago, I had the privilege to moderate an architectural conversation with David George at the home he designed in Preston Hollow at 4818 Brookview. Preceding the event, one of the most delightful afternoons I have spent was talking with David George for hours about his career, his influence, his associates, his architecture. David George discussed how his design evolved but remained firmly rooted in his rigid and rhythmic system of grids and in his conviction that a home can shape and enhance the way one lives. Douglas Newby introducing architects David George and Jim Wheeler in the home David George designed at 4818 Brookview. Modern home architect David George designed in Preston Hollow in 2011. Thinking of David George also brings up such a nice memory of the Great Architects/Great House conversation we had at 4818 Brookview that included architect Jim Wheeler, who worked with him on the Brookview house, along with interior architect Jessica Lendvay and interior designer Beth Saunders. Their experience working with David George on the house was quite moving. They had deep respect for his genius and strong sense of design, and his approach that was receptive to ideas that kept his work incredibly fresh and exciting right up until his death Monday morning, October 7, 2013. Architect David George speaking at Great House/Great Architect conversation. Also pictured seated far right are the owners of 4818 Brookview, Nancy Hodge, P.H.D. and Douglas Orr, M.D and Jessica Lendvey, interior architect, standing far right. In memory of David George, please allow me to share some notes from my opening remarks at this celebration of David George and the conversation about his work that we had with him on April 9, 2011, at 4818 Brookview, home he had just completed at age 88. Every few years there is a home worthy of a Great Architect/Great House conversation. I have always been interested in the architectural lineage and influence of architects. This home, the Texas ranch house, maybe has the greatest architectural pedigree of any house built in Dallas. All the great lines of architecture are represented in this home. Jessica Lendvay’s architectural family tree goes through Svend Fruit and Max Levy to Bud Oglesby. Jim Wheeler worked with O’Neil Ford who was trained by the father of Texas Modern, David Williams. David George has the most incredible lineage of all. He apprenticed with one of the few architects to have a strong personal relationship with Frank Lloyd Wright and who is a Frank Lloyd Wright Fellow today. David George worked with Frank Lloyd Wright on the Gillon house at 9400 Rockbrook in Dallas, the largest residence Frank Lloyd Wright ever designed. David George also worked with Frank Lloyd Wright on the Dallas Theater Center on Turtle Creek. The David George pedigree does not stop there. He did all the working drawings for one of the best midcentury homes in Dallas, the home Harwell Hamilton Harris designed at 9624 Rockbrook. Harwell Hamilton Harris is maybe best known for his work in California, but this home he designed on Rockbrook for Seymour and Jeanne Eisenberg was one of his favorites. Harwell Hamilton Harris designed at Rockbrook in 1957. David George also had an architecture partnership with Arch Swank, another of the great modernists in Dallas who had worked with O’Neil Ford in the 1930s. And just to throw in some spice to this feast of experience was a short stint that David George worked with Charles Dilbeck. This great home at 4818 Brookview is designed by one of the nation’s great architects, David George, is one we have all been waiting for. This home is even more special because architect Jim Wheeler and interior architect Jessica Lendvay, and interior designer Beth Saunders layered expertise and design sensibility on the incredible design of David George. When I first cam through this home, only knowing that David George had been trained by Frank Lloyd Wright, I thought this home seemed influenced by Frank Lloyd Wright and by the Texas modernists architects David Williams and O’Neil Ford. David Williams designed his first Texas modern home at 4408 St. Johns in 1932. This is a large home that almost disappears from the street because it is set back and hugs the land. It reminds us this land was once a prairie now disguised by builders’ exuberance. I was also struck by the plain cut white oak, leaving some texture and grain, conveying a feeling of Texas artisanship in which David Williams was so keen. This vertical and horizontal sliding stick doors invoke the spirit of O’Neil for using stick detail to fill or define a space but not be heavy. From the other houses I have seen that David George has designed, I was anticipating courtyards and loggias, trellises, an invitation to look outside. This home is the best yet. You are not invited to look outside; you are required to look outside. The home is designed as a loggia wrapping around the courtyard and pool. 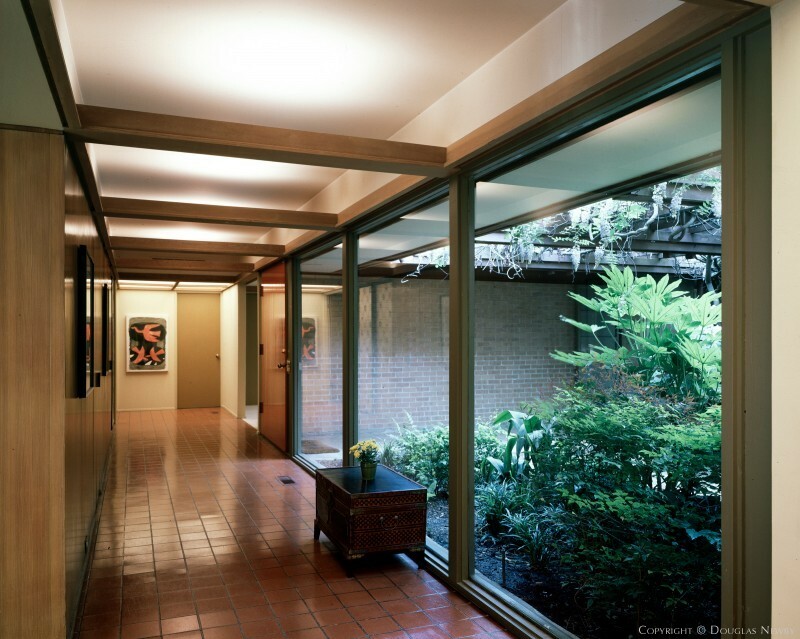 When I think back on the homes David George has designed or the home for Harwell Hamilton Harris in which he did the working drawings, there were trellises that acted as loggias, there were open loggias, closed loggias, some with rooms above, some with just a roof. It sometimes is hard to remember which of the spaces were technically inside spaces and which were outside spaces because they all felt the same, open and easy to walk down a path to a pond or creek. Looking from one room over a courtyard into another room, it becomes even easier to forget which is the outside space and which is the inside space. The plain cut white oak has a texture, but it is not as pronounced or as rustic a wood as David George used on homes he designed 50 years ago, but the effect is the same. As the surfaces in the 21st century have become slicker, smoother and more refined so have the surfaces of this home, but the contrast, the difference from the world around us is constant. We sense an organic feel without being hit over the head with it. Many modern architects design homes that invite one to look out. David George designed this home in way that required one to look out onto the garden or outside environment from every space in the home…. Rear view of 4050 Cochran Chapel Road designed by architect David George 1981. It is quite remarkable the consistent quality of the homes David George worked on and designed, from the 1950s right up to his death at age 91. When the Dallas Chapter, AIA celebrated its 50th anniversary, it selected 50 significant homes in Dallas. David George worked on or designed three of them. He contributed to the Frank Lloyd Wright home on Rockbrook, he did the working drawings for the Harwell Hamilton Harris home on Rockbrook, and he designed the home at 4050 Cochran Chapel Road. David George designed 4234 Shorecrest Drive in 1961. Architect David George designed 4050 Cochran Chapel Road in 1981. Everyone I know who ever had the opportunity to work with David George, to have a home designed by David George, or to just have a conversation with David George was mesmerized by his passion and commitment to design, architecture and life. David George is a large branch of the Dallas and national architecture family tree that produces the best architecture in the country. David George’s ideas and works will continue to influence architecture for generations. We will miss and treasure the fierce independent spirit and talent of architect David George.